T-Shirts that celebrate our Caribbean roots! It looks exactly like the picture! It's perfect! It's a present for my friend and I know she will love it! It gives off the perfect Princess Jasmine vibe and the flowers are the cutest. I wish I could buy another pair for myself. Great quality! Nicer than expected for the price. Highly recommend. ¡Bienvenido a Calle Sol Shop! Although Calle Sol Shop is based out of South Florida, our hearts are still in our hometown of Fajardo, Puerto Rico. 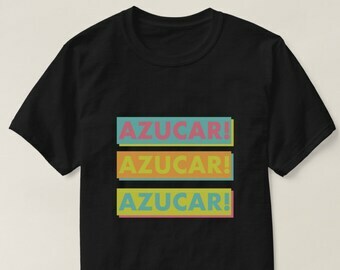 Our t-shirt designs are inspired by memories of Mami in la cocina, cooking arroz con habichuelas and tostones, with salsa playing somewhere in the background. They were made while dreaming of the kioskos we frequented right on Luquillo Beach. The culture of the Caribbean is so rich, and we hope we've captured even a bit of that magic. So stay a while, browse, and feliz compra! Love our logos?! This outrageously talented and creative guy gets all the credit! He's an expert with branding! Every item is hecho a mano to order. If you are interested in custom designs, please send us a message and we will help you out. If you don't see a color you like, whether it's the garment or design, please reach out as we can probably get you what you want! Since all of our products are made to order, all sales are final. We do not offer refunds or exchanges. If you have a question regarding sizing, please contact us before ordering. Sizing issues will not be refunded. In the unlikely chance that you should receive damaged, defective, or the wrong item(s), please message us within 3 business days of the confirmed order delivery date and we will do our best to assist you. Orders are shipped via USPS generally within 3-4 business days (excluding holidays) after we receive your order. Once shipped, your order can take between 2-5 business days for USPS to deliver your package. When your order is shipped, you will receive an email with a tracking number you can use to monitor its progress. USPS failures are not our fault and do not reflect how we treat our customers. What happens after the shipment leaves is out of our control. If your shipment is sent without insurance, Calle Sol is not responsible for lost, stolen or undelivered packages. We are unable to replace or reship items purchased without insurance. If you want to purchase insurance you may do so by contacting us prior to ordering. Be sure to verify your address because we will ship to the shipping address listed in the order confirmation/receipt. This includes Paypal addresses. Any packages returned due to wrong or incorrect addresses will be reshipped at the cost of purchaser.